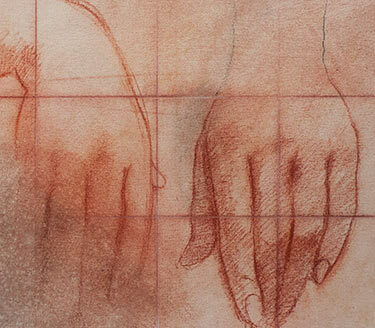 Drawing and painting hands is one of the classic exercises in many traditions of artistic training. Michelangelo, the quintessential master of the Italian Rennaissance, was said to have been so stumped by drawing hands and feet that he dedicated a period of intensive study to observing and drawing both hands and feet. The drawings that follow are all part of a single project, which I do every year alongside my advanced drawing students, of taking an object or theme and producing one hundred pieces. The series following was from 1996. They were part of an exhibition at the Axis Mundi gallery, which is no longer in business. All of the pieces here are on unstretched canvas with acrylic and chalk grid lines. The grid lines are a common feature of drawings from the European Renaissance. They were (and still are) an ingenious method for transferring an image to another surface while preserving the original proportion. Here I'm using the grid to copy photographs of hands from magazine advertisements. And for some reason I like the look of the grid as a compositional element; it seems to affect an element of hauteur to the work.